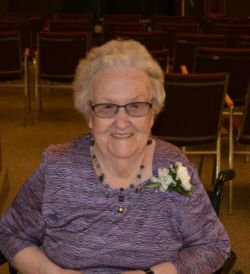 Helen passed away July 28th at Boundary Trails Hospital at the age of 97. She is survived by her sons Ross, Myles (Heather) and daughter Diane, seven grandchildren and eighteen great-grandchildren, a brother George (Mary) McGregor and sisters-in-law Millie Bell and Ruth (Herman) Wold and numerous nieces and nephews. Helen was born and raised in Manitou, Manitoba. She met Bob after the war, married and settled into farm life in Roland Man. Raising three children and being a homemaker kept Helen busy. She was a fabulous cook and always had fresh baked tarts or pies on hand. She did a lot of reupholstering furniture and was a wonderful seamstress. Helen has made many beautiful quilts and continued to quilt up to a few years ago. Her home was always a welcomed place for friends and neighbours to come for coffee or to play a game of cards. Helen enjoyed her later years in the Boyne Towers. She enjoyed the social time every afternoon and she never missed any chance to go out and have a good time. Helen thought so much of her family and showed so much interest in what her grandchildren and great-grandchildren were doing. She lived life fully and will be missed by many. Funeral service will be held on August 11 at 11:00 a.m. at Roland United Church. Rev. Ken Thomas officiating. In lieu of flowers, a memorial donation may be made to a charity of your choice. My mother, Muriel Doerksen, enjoyed being Helen's neighbor in Boyne Towers. Helen was always upbeat and it was truly an honour and pleasure to have known her. Our sincere condolences to the family. Mom will sure miss all the phones calls and the many visits. She was a great neighbor. I used to go over to the towers for some of the things that Nancy was doing and she was so welcoming and kind. Always asked how I was and my family. She will be missed by a lot.